Spring is here which means no more -30 weather, longer days and best of all the spring wardrobe comes out! We have compiled a list of great additions that you need this season! These can all be added to your usual go to pieces that you pull out again and again every spring to add a fresh update! 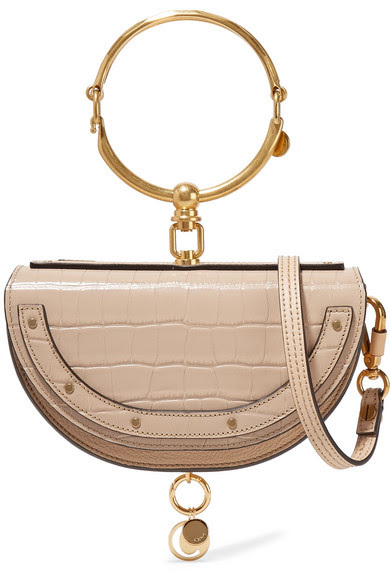 This must have is the Chole 'Nile Bracelet' bag. This croc-effect goes hand in hand with the animal print trend we are seeing everywhere. Decorated with the label's signature gold hardware, it is scaled down to fit you essentials. The bigger the better we always say, and yes we are talking about sunglasses! Gucci's oversized square-frame acetate sunglasses are the perfect accessory to have in your bag. Whether you are lounging by the pool or having morning after brunch, these baby's will give you the maximum coverage you are looking for. If you are planning on investing in a piece of jewellery this spring, you had better make sure it makes a statement! These clip on 'Curubas Mágicas' are gold plated and hand woven with teal and black thread.